Certain roles require actors to undergo physical transformations to truly resemble the character or real-life person they are trying to portray. Here are five actors who have undergone the most gruelling and extreme physical changes for a movie role. Jake Gyllenhaal undertook an intense regime twice a day to prepare for his role as Billy Hope in Southpaw. Before bulking up for Antoine Fuqua’s boxing film, he’d lost loads of weight to star in Nightcrawler (2014), so it’s clear how committed of an actor Gyllenhaal is, and he has yielded some dramatic results. In just six months, Chris Pratt lost a whopping 65 pounds to play galactic hero, Peter Quill in the action-packed Marvel film. Quite an inspirational transformation to say the least. For his role as an MMA fighter in Warrior, Tom Hardy went from looking very average to having the ultimate fighter’s physique. He then packed on even more muscle mass to play Bane in The Dark Knight Rises (2012). Christian Bale losing 60 pounds for his role in The Machinist, is just as equally impressive as when he bulked back up after to play Batman in Christopher Nolan’s Batman Begins. During his weight loss, he was getting by on a diet of coffee and apples. Just ridiculous, right?! Good list. I was hoping that Chris Pratt and Tom Hardy were on this list! No way I could not include them ! I think the only other one I would add into this list is Mickey Rouke. It was a while ago but if you see the difference from his first movies compared to The Wrestler and Iron Man 2, the transformation is scary. The thing about Rouke is he didn’t do it for a specific film either. He actually went into boxing and then ‘real’ wrestling in the 1990’s, leaving acting for almost a decade. That’s really interesting actually, I didn’t know he became an actual wrestler. ‘The Wrestler’ is a great film as well. Ah such transformations…did anyone really see Southpaw though? hah.. I did, saw it at the cinema, thought it was pretty good lol. Christian Bale really goes for it on the transformation front. Big dedication. 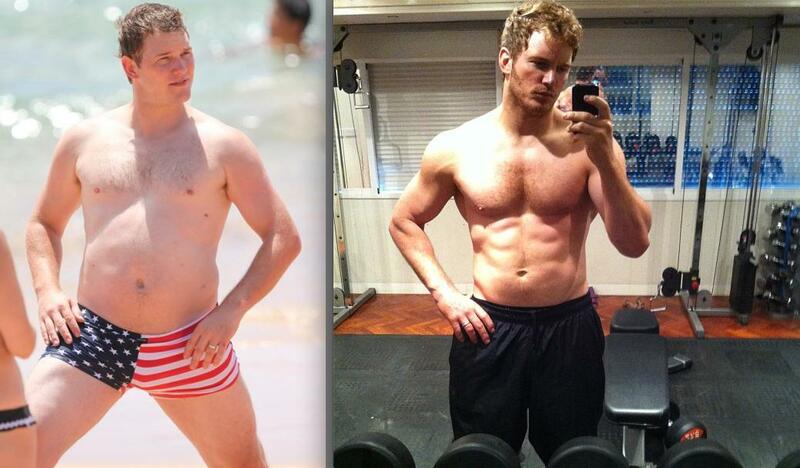 Wow, Chris Pratt really got into shape didn’t he? I never knew Pratt looked like that before now. Love the Tom Hardy quote that goes with this post. You wonder what kind of damage this does to the body though. I wanted to see Christian Bale for The Machinist on this list, and I did! Great list. Some also say he did a lot for The Fighter. Yep he lost a lot weight for The Fighter. I still need to see The Machinist.